1817. ERNE PACKET. Typhus deaths, Kościuszko, Robbery of the Belfast Mail. 25-12-1817. THE MARQUIS D’ANTONELLE, better known in the revolutionary history of France by the name of Pierre Antoine, died lately at Arles, his native place, aged seventy, he was a Member of the Convention, in which he acted a very distinguished part; was persecuted by Robespierre; pursued by the Directory; and neglected by Bonaparte. His political writings were numerous, and memorable for their ability. He was one of the principal Editors of the famous Journal des Hombres Libres. At the restoration of the Bourbons in 1814, he published a pamphlet, in which he openly embraced their cause. 25-12-1817. ADVANTAGES OF CLEANLINESS.—Tuesday, at a meeting of the Subscribers to the House of Recovery, or Fever Hospital, Waterford, it was stated from the proper Committee, that 1,120 dwellings, which had been whitewashed for the poor people, and provided with fresh straw beds, had since whitewashing, sent but four patients to the House. It would be difficult to conceive a stronger proof of the advantages of cleanliness.— Waterford Mirror. 25-12-1817. AT THE I’ECOLE ROYALE, IN PARIS, lectures are now delivering in the Persian, Arabic, Turkish, Armenian, and Modern Greek languages. 25-12-1817. THE INQUISITION, say the last accounts from Spain, has been very active for some time past, particularly in the Provinces, where several persons have been arrested, the greater part of them charges with Freemasonry. 25-12-1817. ON SUNDAY LAST THE following prayer for deliverance from the prevailing sickness or plague, was offered up in several of the churches in Limerick, “Oh Almighty God, who in thy wrath didst send a plague upon thine own people in the wilderness, for their obstinate rebellion against Moses and Aaron, and also in the time of King David, didst stay with the plague of pestilence three score and ten?? 18-12-1817. A BOXING MATCH which took place on Monday near Westport, between two men of the names of Patrick McDonagh and Patrick Browne. The former, either in a fall, or by a blow from his opponent, received what appeared to be a slight wound on the forehead, when the persons present interfered and reconciled the combatants, and conducted McDonagh to his home, where he had scarcely arrived when he expired. He was in appearance a much stronger man than Browne. An inquest was held on the body of the deceased and a verdict of Manslaughter was returned against the survivor. 13-11-1817. KOSCIUSKO. The hero of Poland, the brave, disinterested and virtuous Kosciusko is stated, in an article from Lausanne, to have died at Soleure on the 15th instant. A singular felicity of reputation has even attended this amiable citizen and Warrior. — In the case of genuine liberty he fought against injustice, and shamed both the tyrants and Jacobins of the age. In his days of power, at the head of armies that adored his name, no false glory dazzled him nor corrupt ambition could betray him. He nobly resisted the foreign potentates who had laid waste his country; not because they were Kings and Emperors, but because they were invaders and oppressors. He combated with no rebellious sword—far no ambiguous object. When Poland lost her independence, Kosciusko lost his home; as she sunk he rose; but not upon her ruins. The Court of Russia would have allured this illustrious defender of the people whom he had subjugated, by temptations irresistible to vulgar minds: Bonaparte would have made him the flattered instrument of a spurious and hollow liberality to his countrymen: but Kosciusko saw that their lot was irretrievable; and his own he refused to change.— as a soldier and a patriot, in public life and in retirement, his principles were untainted, and his name unsullied: the Monarchs whom he opposed respected him: the factions who failed to seduce, forebore to slander him; and he would have been the Washington, had he not been the Wallace, of Poland. (From the Internet) Andrzej Tadeusz Bonawentura Kościuszko (Andrew Thaddeus Bonaventure Kościuszko; February 4 or 12, 1746 – October 15, 1817 was a Polish–Lithuanian military engineer and a military leader who became a national hero in Poland, Lithuania, Belarus, and the United States. He fought in the Polish–Lithuanian Commonwealth’s struggles against Russia and Prussia, and on the American side in the American Revolutionary War. As Supreme Commander of the Polish National Armed Forces, he led the 1794 Kościuszko Uprising. Kościuszko was born in February 1746 in the Polish–Lithuanian Commonwealth, in a village that is now in Belarus; his exact birthdate is unknown. At age 20, he graduated from the Corps of Cadets in Warsaw, Poland, but after the outbreak of a civil war involving the Bar Confederation in 1768, Kościuszko moved to France in 1769 to pursue further studies. He returned to Poland in 1774, two years after its First Partition, and took a position as tutor in Józef Sylwester Sosnowski’s household. After Kościuszko attempted to elope with his employer’s daughter and was severely beaten by the father’s retainers, he returned to France. In 1776, Kościuszko moved to North America, where he took part in the American Revolutionary War as a colonel in the Continental Army. An accomplished military architect, he designed and oversaw the construction of state-of-the-art fortifications, including those at West Point, New York. In 1783, in recognition of his services, the Continental Congress promoted him to brigadier general. Returning to Poland in 1784, Kościuszko was commissioned a major general in the Polish–Lithuanian Commonwealth Army in 1789. After the Polish–Russian War of 1792 had resulted in the Second Partition of Poland, he organized an uprising against Russia in March 1794, serving as its Naczelnik (commander-in-chief). Russian forces captured him at the Battle of Maciejowice in October 1794. The defeat of the Kościuszko Uprising that November led to Poland’s Third Partition in 1795, which ended the Polish–Lithuanian Commonwealth’s independent existence for 123 years. In 1796, following the death of Tsaritsa Catherine the Great, Kościuszko was pardoned by her successor, Tsar Paul I, and he emigrated to the United States. A close friend of Thomas Jefferson, with whom he shared ideals of human rights, Kościuszko wrote a will in 1798 dedicating his American assets to the education and freedom of U.S. slaves. He eventually returned to Europe and lived in Switzerland until his death in 1817. The execution of his will later proved difficult and the funds were never used for the purpose he had intended. 13-11-1817. MARRIED, In St. Mark’s Church, by the Rev. Joseph Druitt, James Johnson, of Drum, County of Monaghan, Esq. to Miss E. Reeves, daughter of the late D. H. Reeves, Esq. and niece to Colonel Reeves of the 27th Regiment. 13-11-1817. On the 21st inst. at Eyrecourt, Walter Lambert, Esq. eldest son of Walter Lambert, Esq. of Castle Lambert, county Galway, to the amiable and accomplished Anne, eldest daughter of Giles Eyre, Esq. of Eyrecourt-Castle, and Lieut. Col. of the Galway Militia. 13-11-1817. DIED. On Saturday last, in the prime of life, of Typhus fever, the Rev. James McKenna, Parish Priest of Tempo. — A young man of the most amiable character and exemplary conduct, and deeply lamented by his acquaintances, and congregation. On the same day, of Typhus fever, Mrs, McDonald, wife of Mr. Edward McDonald of this town. Baker. On Monday morning, of Typhus fever, at Mount-Irvine, near Clogher, in the prime of life, Surgeon George Irvine, R, N., son of Mr. Acheson Irvine, of Derrygore, near this town. At Strabane, on the 20th ult. of Typhus fever, John Glasse, Esq. Attorney. On the same day, of Typhus fever, Mr. Spence, Saddler. At same place, on the 2nd inst., of Typhus fever, Mrs. Perry, wife of Mr. John Perry. At same place, on the 31st ult. after a few days illness, of Typhus fever, Mr. Adam Burrell. On the 31st ult., Mrs. Saunders, wife of Mr. Saunders, of Foyle College, Derry. In Bishop Street, Derry, Mr. Billington. In Ferry-quay-street, Derry, Mrs. Kelly, in the prime of life. At Swords, on the 5th inst., of Typhus fever, caught in the execution of his clerical duties, the Rev. James Wallace a Gentleman regretted by all who knew him. On the 30th, of Typhus fever, Anna, only surviving child of John Fetherston H., Esq. of Grangemore, County of Westmeath. (From the Internet.) Typhus is any of several similar diseases caused by Rickettsia bacteria. The name comes from the Greek typhus (τύφος) meaning smoky or hazy, describing the state of mind of those affected with typhus. The causative organism Rickettsia is an obligate intracellular parasitic bacterium that cannot survive for long outside living cells. It is transmitted to humans via external parasites such as lice, fleas, and ticks. While “typhoid” means “typhus-like”, typhus and typhoid fever are distinct diseases caused by different genera of bacteria. The following signs/symptoms refer to epidemic typhus as it is the most important of the typhus group of diseases. Signs and symptoms begin with sudden onset of fever, chills, headache, and other flu-like symptoms about 1 to 2 weeks after being infected. Five to nine days after the symptoms have started; a rash typically begins on the trunk and spreads to the extremities. This rash eventually spreads over most of the body, sparing the face, palms, and soles. Signs of meningoencephalitis begin with the rash and continue into the second or third weeks. Other signs of meningoencephalitis include sensitivity to light (photophobia), altered mental status (delirium), or coma. Untreated cases are often fatal. In historical times “Gaol Fever”, was common in English prisons, and is believed by modern authorities to have been Typhus. It often occurred when prisoners were crowded together into dark, filthy rooms where lice spread easily. Thus “Imprisonment until the next term of court” was often equivalent to a death sentence. Prisoners brought before the court sometimes infected members of the court itself. Following the assizes held at Oxford in 1577, later deemed the Black Assize, over 300 died from gaol fever, including Sir Robert Bell, Lord Chief Baron of the Exchequer. The Black Assize of Exeter 1586 was another notable outbreak. During the Lent assizes court held at Taunton in 1730, gaol fever caused the death of the Lord Chief Baron, as well as the High Sheriff, the sergeant, and hundreds of others. During a time when persons were executed for capital offenses, more prisoners died from ‘gaol fever’ than were put to death by all the public executioners in the British realm. In 1759, an English authority estimated that each year a quarter of the prisoners had died from gaol fever. In London, gaol fever frequently broke out among the ill-kept prisoners of Newgate Prison and then moved into the general city population. In May 1750, the Lord Mayor of London, Sir Samuel Pennant, and a large number of court personnel were fatally infected in the courtroom of the Old Bailey, which adjoined Newgate Prison. 13-11-1817. ROBBERY OF THE BELFAST MAIL COACH. Friday evening, about ten minutes after six o’clock, as the Belfast Day Mail Coach, on its way to Dublin, arrived at Lissen-hall, a short distance beyond Swords, the Coachman found his way obstructed by two carts being placed across the road. Soon afterwards, a body of armed men, ten or twelve in number, appeared; the front horses were seized, and, about the same time, the banditti fired three shots, one of which passed through the hat of one of the guards, Luke Rocheford and unfortunately took effect in the back part of his head, but, we trust, without any serious result. The passengers, eleven in number — seven outside and four inside—many of them females, were then rifled in the most brutal manner, of the valuable effects and property about them; which was a small gold watch, maker’s name, Arnold and Sons, London, and supposed to be Number 217; a gold seal, and the initials marked upon it, W. S., in Irish characters; also, a gold watch, maker’s name, Thomas Moss, Ludgate-street, London; a great variety of bank notes, among which was one of the Bank of Ireland, for five pounds, dated 4th December, 1816. We give this hasty description of those articles, in the hope of their leading to a detection. Two artillery men passed by at the time, but took no notice of the proceedings, more than enquiring, “what was the matter,” and being informed, they went forward quietly- Those men can easily be ascertained to give evidence, if necessary. A carman was also stopped, but no molestation offered to him.— While the robbers were engaged in plundering the passengers, a post coach came up, in which were the Marquis of Donegal, his son, (Lord Belfast,) and another gentleman, all well armed. An attempt was made to stop the post coach, but, by the exertions of the coachman, in whipping the horses over a large trunk, they most fortunately escaped. They had not proceeded far, when they met a party of horse patrole, who immediately went in quest of the robbers: a foot patrole had also been sent in that direction, in consequence of a robbery having been committed the night previous, at the house of Mr. Harckney. We have the pleasure to state that none of the passengers in the Belfast coach have suffered any personal injury, and also that the entire of the mail-bags have been preserved. We have little doubt that some of the delinquents will be apprehended. The Post Office will, of course, do its duty; and we hope that the poor wounded guard, who preserved the mail bags, will not go without attention and reward. Mr. Farrell requested the attendance of the respective passengers at the Head Police office, this morning when a further investigation will go forward before the Magistrates; and we cannot omit noticing the urbanity and politeness of Lord Belfast, in disclosing and furnishing us with such particulars of this transaction, as came within his immediate knowledge or observation. Carrick’s Morning Post. Five persons have been apprehended for the above Robbery, and after a long examination on Monday last, at the Head Police Office, Dublin, three of them were fully committed for trial. Poison Gas and Poor Finnegan of Enniskillen and the Inniskillings. The headline in the Fermanagh Herald of May 13th read INNISKILLINGS GASSED. ULSTER JOURNALIST’S DEATH. SERGEANT P.P. FINNEGAN. Finnegan was well known in Enniskillen and a popular journalist as testified below by his colleagues. The following is a copy of a letter from Lieutenant E. Gallagher, 7th Inniskillings to his brother Mr Henry T. Gallagher, Crown Solicitor, Strabane. John Singer Sargent was commissioned as a war artist in 1918. Dear Harry, – Just on my way somewhere; we are in a hospital train, and it’s like our own officers mess, so many of the old hands are here, gassed. As for the Irish, they easily carried the day, men and officers. I was gassed in the second attack (gas) after having a good half hour bowling over Bosches and looking forward to another good time. My platoon sergeant, poor Finnegan – was with me and he did buck us up; he kept shouting on the Bosches ‘Come on Fritz; we have some lovely presents for you,’ and they got them. Then when the Bosche saw he had failed he sent us more gas and it was terrible seeing poor fellows dropping on all sides. Then I felt my own time coming; words could not describe it. I had my helmet on, but it must have had some defect. However, I began to feel the gas: first it made me gasp; and then it turned me blue; my chest weighed a ton and my head was ready to crack and I coughed until I thought I would cough my insides up. I thought I would try and find the dressing station. On my way I came across poor Finnegan and he was as bad; we got on about 100 yards when we both collapsed. We just clung to one another and Finnegan said ‘Sir, we have no chance.’ I agreed as I was exhausted. Finnegan shouted out: ‘By God, Sir isn’t it terrible to die like this! If we had only got a sporting chance; but no one could beat this.’ After half lying, half standing, clinging to one another for about 10 minutes and going through terrible agony, I said to Finnegan, come on let us make one last effort, and we did. I helped poor Finnegan along. At last he said, ‘Go on sir, I am done.’ However we plodded along creeping and walking in a trench with two feet of mud. I found myself at the dressing station about done up. I sent out a party for Finnegan, but he could not be found. He was found that night dead. A plucky soldier – he had no fear. Our boys did well. Harry, if you could have seen them it would have delighted you. There was no pause, every man went at it, and after the first attack they actually fought as to which company had the best ‘bag’ outside their parapet and to hear them bragging ‘that fellows helmet beside your big shell hole is on our side of the wire. It was glorious and I was just thinking how pleased the people at home will be when this will be told in full. Then in a day’s time I got a paper and what do I see? This terrible rebel rising in Ireland. Poor old Ireland! Betrayed again! I am getting along as well as can be expected. It takes time to get the gas out of one’s system. However a few weeks will make me fairly up to the knocker. Best love to all in Dunwiley. Harry. May be home sooner than I expected. I.R. 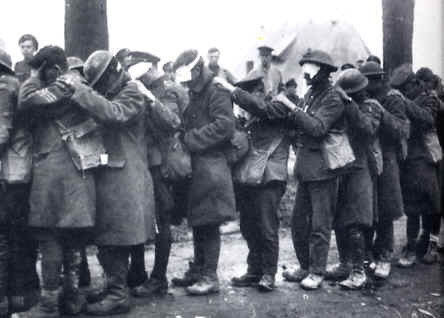 Poison gas was probably the most feared of all weapons in World War One. It was indiscriminate and could be used on the trenches even when no attack was going on. Whereas the machine gun killed more soldiers overall during the war, a death that was frequently instant or not drawn out and soldiers could find some shelter in bomb/shell craters from gunfire, a poison gas attack meant soldiers having to put on crude gas masks and if these were unsuccessful, an attack could leave a victim in agony for days and weeks before he finally succumbed to his injuries. 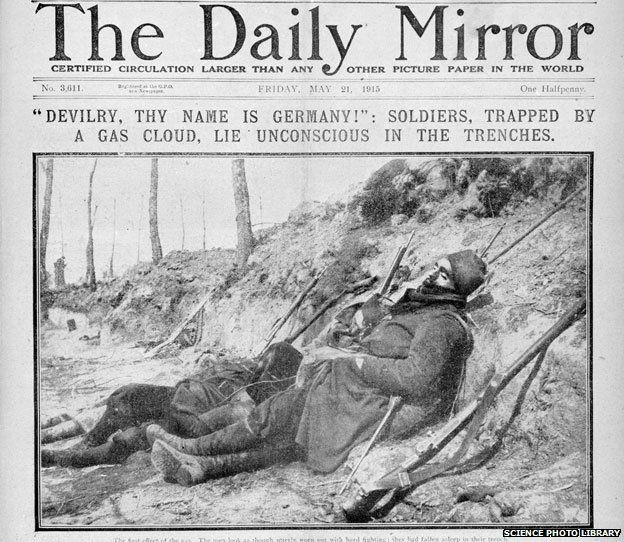 It is generally assumed that gas was first used by the Germans in World War One. This is not accurate. The first recorded gas attack was by the French. In August 1914, the French used tear gas grenades containing xylyl bromide on the Germans. This was more an irritant rather than a gas that would kill. It was used by the French to stop the seemingly unstoppable German army advancing throughout Belgium and north-eastern France. In one sense, it was an act of desperation as opposed to a premeditated act that all but went against the ‘rules’ of war. However, while the French were the first to use a gas against an enemy, the Germans had been giving a great deal of thought to the use of poison gas as a way of inflicting a major defeat on an enemy. In October 1914, the Germans attacked Neuve Chapelle. Here they fired gas shells at the French that contained a chemical that caused violent sneezing fits. Once again, the gas was not designed to kill but rather to incapacitate an enemy so that they were incapable of defending their positions. This took place against a background of a war in the west that was still mobile. Once trench warfare had literally dug in all sides involved in the conflict looked for any way possible to bring movement back into their campaigns. One of the more obvious was to develop a weapon that was so appalling that it would destroy not only an enemy frontline but also the will to maintain troops on that frontline. Poison gas might even provoke a mass mutiny along a frontline thus causing it to collapse. In other words, poison gas was the answer for the war’s lack of mobility. Poison gas (chlorine) was used for the first time at the Second Battle of Ypres in April 1915. At around 17.00 hours on the 22nd April, French sentries in Ypres noticed a yellow-green cloud moving towards them – a gas delivered from pressurised cylinders dug into the German front line between Steenstraat and Langemarck. They thought that it was a smokescreen to disguise the forward movement of German troops. As such, all troops in the area were ordered to the firing line of their trench – right in the path of the chlorine. Its impact was immediate and devastating. The French and their Algerian comrades fled in terror. Their understandable reaction created an opportunity for the Germans to advance unhindered into the strategically important Ypres salient. But even the Germans were unprepared and surprised by the impact of the gas and they failed to follow up the success of the chlorine attack. What did occur at Ypres was a deliberate use of a poison gas and now, other nations with the ability to manufacture poison gas could use it and blame it on the Germans as they had been the first to use it in this fashion. The first nation to respond to the Ypres gas attack was Britain in September 1915. The newly formed Special Gas Companies attacked German lines at Loos. In the Ypres attack, the Germans had delivered their chlorine by using pressurised cylinders. For the attack at Loos, the British also used gas cylinders. When the wind was in a favourable direction, chlorine gas was released from the British front line so that it could drift over to the German front line. This was then to be followed by an infantry attack. However, along parts of the British front line, the wind changed direction and the chlorine was blown back onto the British causing over 2,000 casualties with seven fatalities. The Special Gas Companies were not allowed to call their new weapon gas – it was referred to as an “accessory”. However, the risk of the wind blowing gas back onto you also affected the Germans and French in some of their gas attacks during late 1915. 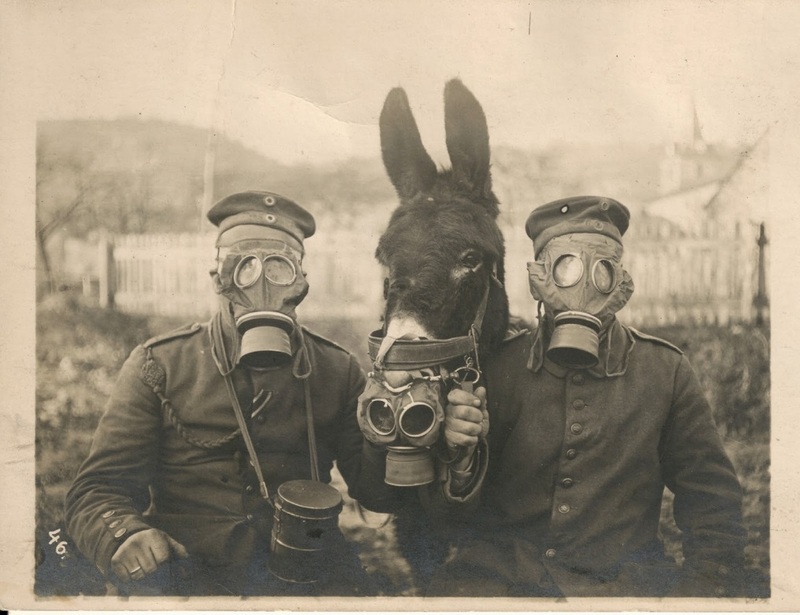 Two German soldiers and their mule. The development in the use of poison gases led to both phosgene and mustard gas being used. Phosgene was especially potent as its impact was frequently felt only 48 hours after it had been inhaled and by then it had already bedded itself in the respiratory organs of the body and little could be done to eradicate it. Also it was much less apparent that someone had inhaled phosgene as it did not cause as much violent coughing. By the time that phosgene had got into a person’s bodily system, it was too late. Mustard gas was first used by the Germans against the Russians at Riga in September 1917. This gas caused both internal and external blisters on the victim within hours of being exposed to it. Such damage to the lungs and other internal organs were very painful and occasionally fatal. Many who did survive were blinded by the gas. By the time the war ended, the main user of poison gas was Germany, followed by France and then Britain. Though poison gas was a terrifying weapon, its actual impact, rather like the tank, is open to debate. The number of fatalities was relatively few – even if the terror impact did not diminish for the duration of the war. The British army (including the British Empire) had 188,000 gas casualties but only 8,100 fatalities amongst them. It is believed that the nation that suffered the most fatalities was Russia (over 50,000 men) while France had 8,000 fatalities. In total there were about 1,250,000 gas casualties in the war but only 91,000 fatalities (less than 10%) with over 50% of these fatalities being Russian. However, these figures do not take into account the number of men who died from poison gas related injuries years after the end of the war; nor do they take into account the number of men who survived but were so badly incapacitated by poison gas that they could hold down no job once they had been released by the army. Armies quickly produced gas masks that gave protection as long as sufficient warning was given of a gas attack. Soldiers also used make-shift gas masks if they were caught in the open without a gas mask during a gas attack – cloth soaked in their own urine and placed over the mouth was said to give protection against a chlorine attack. By the end of the war, relatively sophisticated gas masks were available to soldiers in the trenches on the Western Front. “Poison Gas and World War One”. HistoryLearningSite.co.uk. 2014. Web. The Fermanagh Herald paid tribute to their former reporter as follows: – Sergeant Finnegan was, prior to joining the Inniskillings, a member of the reporting staff of the Fermanagh Herald and was well known all over the North West. He was an able and reliable journalist and was held on the highest esteem by his colleagues and by everyone who came in contact with him in the discharge of his duties. He was a prominent member of the National Volunteers and as Lieutenant Gallagher says was a plucky and fearless soldier. He was the typical Celt, genial, kindly, and good natured, and a sparkling wit, his gifts as a raconteur and his mellow brogue gave him a warm reception in social circles. He was a splendid Gaelic scholar, and was able to report the most fluent Gaelic speakers, an accomplishment which few Pressmen possess. His remains now rest in France – far from Kilkenny and the banks of the silvery Nore where his childhood days were spent. That his soul may rest in peace is the earnest prayer of his former colleagues. We tender our sincere sympathy to his relatives in their bereavement.